To help teenagers become responsible citizens and future leaders of our nation. To create an environment in which students can increase their political awareness and understanding, while learning the meaning of social action through an actual experience in government. 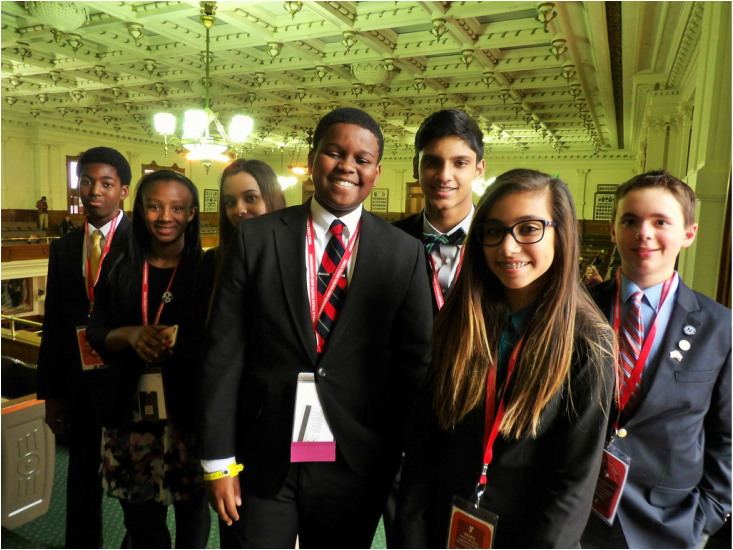 The youth legislature is composed of the middle school students with the appropriate officers for the legislative. Members of the prepare legislation (Bills) for consideration, debate, and action. Research using the library, internet, interviews with experts and so forth to develop a strong bill is a must. Students will learn parliamentary procedure and oral presentation skills. Like legislative but you work in a team of 3. You get topics and you choose and take a stance on your topic and support your stance. YMCA Texas Model United Nations is a youth development program in which 8-12 grade students simulate the United Nations as member states who meet to to solve pressing global problems with the art of compromise and diplomacy. Join us and change your world. Congratulations to all and great job Governor Davis Winn! !